A holiday for the whole family. We know what it's like trying to find somewhere that will accept dogs when you want to get away. You don't want to leave them at home or put them in kennels! 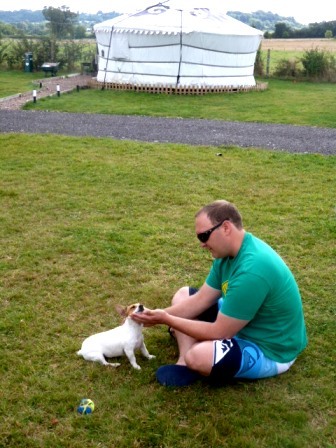 For this reasons, we've made sure that we have some of our glamping accommodation to accommodate our furry friends. Furry guests are important too. We cater for your dog as another guest. Each dog has a blanket or bed and a dog bowl to use during their stay, as well as a yummy dog treat & a toy to keep! A small fee of £17.50 applies for each pet. This covers your whole stay. We also have plenty of lovely countryside for dog walking as well as local dog friendly restaurants and bars. Dogs are welcome in our Yurts, Bell tents and Country Kabin. Please mention the number of dogs you wish to add to your booking when enquiring about specific accommodation.